Although it looks deceptively simple, the Eheim 2217 canister filter (also known as the Eheim Classic 600) is one of the most popular filters in the hobby. Eheim has been making aquarium equipment for over fifty years, and their filters are praised for their performance. But how good is this filter actually? 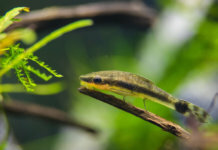 Is it the right choice your aquarium? In this review, we’ve decided to take a closer look at the Eheim canister filter and see what it can really do. 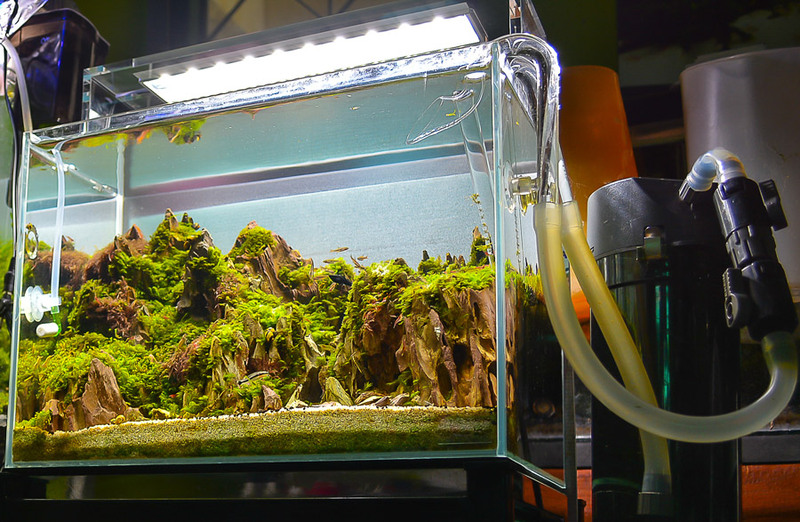 The Eheim 2217 filter can be used on freshwater and saltwater aquariums up to 160 gallons. This filter has a flow rate of 264GPH – which isn’t bad. However, it’s real power lies in it’s exceptional construction; the quality design ensures good filtration, despite the average output. While most external filters on the market include several baskets for filter media, the Eheim filter has gone with an “old school” design, and only has a single chamber. Although some buyers consider this design outdated, we loved it; a single chamber allows much more flex when adding filter media. To top it off, the Eheim 2217 has an enormous capacity of 1.6 gallons, ensuring comprehensive, quality filtration. Most canister filters have the intake/outtake valves located at the top. The Eheim 2217 has an intake tube on the bottom of the filter, while the output is on top. This ensures that water passes directly through the filter media, and leaves very little room for water bypass. All dirt and debris from the fish tank is caught by the media, instead of ending up back into your aquarium. Although it’s extremely effective at it’s job, the Eheim 2217 is very low-profile. We found it to be less noisy than most similarly priced filters, and it has a low energy consumption of just 20w. Additionally, it only 15.8 inches tall, and you can easily fit one or more filters under almost any aquarium. Above all else, a canister filter needs to be reliable. 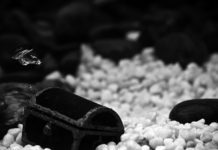 Malfunctions and leaks are a very common concern among beginner and experienced aquarium owners alike. 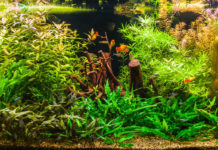 Fish cannot survive without an aquarium filter, and even a tiny leak on a canister filter can turn into a flooded room when you’re not watching. With this in mind, the 2217 canister filter is our top choice when it comes to durability. Eheim filters are known for being robust and sturdy; some users we surveyed claimed to have owned an Eheim for over a decade without a single issue. Almost every part of this filter seems extremely durable, and the Eheim 2217 comes with a 24 month warranty to boot. Unfortunately, we found that the Eheim 2217 lacks some features that most competitors have. This canister filter doesn’t come with a self-priming system; manual priming is a tedious process that most external filters have advanced over by now. If you own a small or medium-sized aquarium, the Eheim Classic series features several canister filters of different sizes and capacities. 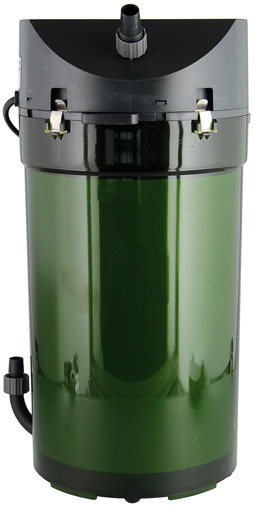 The Eheim 2213 filter, the smaller sibling of the 2217 model, is a very popular choice for fish tanks up to 66 gallons. The Eheim 2213 has a flow rate of 116 gallons per hour, and is 14″ tall. Although the 2213 has less capacity and output power than the 2217, it also requires much less power to run – only 8 watts. The Eheim 2213 filter comes with a removable basket for filter media, which makes cleaning and maintenance somewhat easier. Otherwise, the 2213 is just a smaller 2217. If your tank is within it’s specified volume and you have no plans of upgrading in the future, the Eheim 2213 canister filter is an excellent option. The Eheim 2217 filter does it’s job effectively. No glitters or flashes; just simple efficiency. Despite it’s extremely simple design and a lack of a self-priming system, this canister filter is well-worth the price tag.